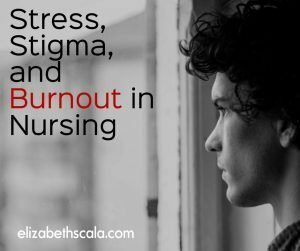 As a nurse, have you experienced the stress and stigma related to burnout in nursing? A few months ago, I wrote a blog post entitled “The Way We Think About Nurse Burnout is Broken”. I went on to list ten ways that burnout is approached in a broken way. Since a nurse does not want to be seen as weak or viewed as though he or she is a failure, we tend to sweep burnout under the carpet. I saw a post on social media that wanted to eliminate the use of the term “burnout” and call it something else. If we assume that the person experiencing burnout did something “wrong” then of course they will not admit that they are feeling this way and will not seek out much-needed help. Let’s take a few examples here. To shed light on how burnout in nursing might be stigmatized. And to start talking about it more so that this stops happening. Nurse Jane is on her third 12 hour shift in a row. It is about half way into the shift, and she is tired. In fact, she needs a break. She skipped breakfast this morning so that she could get 10 more minutes of sleep and is now starting to feel light-headed. Jane wonders if she can make it the rest of the six hours through the shift. She has not heard anything about lunch breaks yet, however she desperately needs to get something to eat. Does she ask the charge nurse for a break? How likely is she to go off the unit and get something to eat? Burnout in nursing is real. Yet we do not seem to want to talk about it. Nurses wind up feeling stigmatized by the stress. We just keep putting on that brave face, showing up day after day, and don’t know what to do about it. It is time to stop sweeping the stigma of burnout under the carpet. Nursing is hard work. The job IS stressful. And you are not a superpower. You are a human being. You need a break from time-to-time. It’s normal. You can say “no”. Let someone else help out. Your feelings are valid. Others feel them too. Your worries are real. Talk about them to other people. Things can change. You can choose something different. 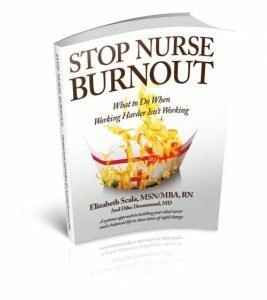 If you are experiencing burnout in nursing, you did not do anything wrong. You are not damaged goods. You should not suffer silently, fearing the shame and blame that you fear. In fact, you could very well be doing it all right. When it comes to your job. Organizations are struggling with nurse burnout. They do not know what to do with this issue or how to decrease the stress. Individuals can do their part by increasing their own personal resiliency. And, in addition to what we can do on our own, we need our workplaces to partner with us to make the workplace safe, healthy, and a true caring environment. Do I have all of the answers? No. I have strategies that can help. Solutions that have worked in my own experience. Help for nurse burnout is available! You as an individual nurse must take a stand against burnout. You must choose your own well-being. Put yourself first. Put strategies in place that allow you to enjoy your job and your life. Your organization must partner with you. They must care about you as a human being. If you find that this is not the case, then maybe it is time for a change. Thank you for starting the conversation about this important issue in the nursing profession! I agree with so much of what you write here. But we might differ on one point (or at least my interpretation of it). I would say that while it is common to feel “sadness that this is your life, your career”, I’m not sure that is “normal”. I have certainly felt that kind of sadness, which is why I chose to step away completely and reevaluate if I want to dedicate my life to a career that involves such stress, anxiety, and sadness. I am still a nurse and I use my knowledge, but I don’t work in a traditional setting, and I also own a business completely unrelated to health care. No one should dread going to work every day and feel sad that this is the life that they are living. If you feel that on a consistent basis, I would say that it is time to move on, or at the very least, seek the help of career coaching services. It is normal for most people not to LOVE their job EVERY SINGLE DAY. Every job has ups and downs. 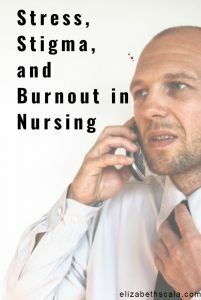 But for the most part, the type of stress and burnout that I and many of the nurses that I know have experienced seems at least somewhat unique to the profession. I don’t pretend to know all the answers, but there are deep, systemic problems within the profession that promote burnout. I absolutely agree that personal resiliency is key. Banding together to stand against the poor practices of employers and refusing to sacrifice patient care for profit would also make a big difference. I respect the work that you are doing, and I sincerely hope that you are able to help more employers understand how they contribute to burnout and stress. I couldn’t agree more. Thank you for your insightful comments, Katy. We need to find a place where we LOVE what we do, while focusing on caring for ourselves. Great points and thank you for sharing this here with myself and the readers! Thanks for making this topic a priority in your writing and your work. Suffering from burnout takes away the joy of our work- and we do suffer- so do our patients and our coworkers. Talking about it brings attention to it and solutions will follow. Nursing is a wonderful career and burn out is real. This article should empower nursing to make changes. Thanks for sharing Elizabeth. Mary Ann Wietbrock RN MSN Cardinal Elements Inc. If I had known what you are saying here, I would never told my kids to not become nurses when they suggested that. At the time I was burned out, and did not know how to get out from under it. Now burnout is systemic to our culture. I talk with pharmacists, lawyers, and physicians in addition to my dear nurse colleagues. Starting with the insight that we are human beings, and what that means, recognizing the symptoms, talking about feelings, and getting help is essential to a healthy life that includes balance. Empowering people to take responsibility by looking at whether the work setting is partnering with them, or just using them is so, so important. Thanks for your clarity and keeping this topic on top of the rug, and now on the table! Thanks, Padma! And you are so right about the fact that many professionals are experiencing burnout. It is not just nursing and so the profession of nursing is not to blame. While there are things that organizations can do to support the nurses that they employ, the nurse really is accountable for their own thoughts, feelings, and actions. So partnership is key! Thanks for your comments, appreciate it. I appreciate you continuing to blog about the subject on burnout. It’s important for us as nurses and nurse leaders to recognize the symptoms of burnout and to support fellow nurses, who are experiencing it. I am a firm believer and advocate of shifting the culture of nursing from self-sacrificing to one that promotes self-care. Wonderful, thank you so much for your efforts in this self-care movement, Cassandra! One of the reasons I became a Mindful Meditation teacher instead of going back to a nursing job was I remember burnout and the stress that came with the lack of support so many nurses feel. I know that Mindful Meditation would help with some of the burnout symptoms and increase resiliency which is an incredible skill to have for anyone. But one of the mail problems is the lack of support so many nurses, pharmacists, lawyers, physicians from their employers. I am practicing nursing in a different way and hoping for good results for my students. Find a Mindful Meditation teacher or group in your community, practice and you will be amazed at how much better you will feel. This is very true. Mindfulness can certainly help us stay present and put things into perspective. I am glad that you found a healing and healthy practice that you enjoy, Julia. Thank you very much for sharing! And you are right. You ARE practicing nursing. In a unique and special way. Would love to have you on the podcast one day! !